Most of desktop environment, the location of icons folder is same. On /usr/share/icons, or on the home user at .icons folder (hidden files). The simple way is copy icon folder into that folder location. To make icon available for all user, you can put the folder into /usr/share/icons, and for user only, put icons on .icons folder at home user. To change icon is easy. Because It's using gtk2 theme. It applied to XFCE, Mate, and Gnome too. Click start then preferences, them choose customize looks & feels. Then click icon themes tabs. 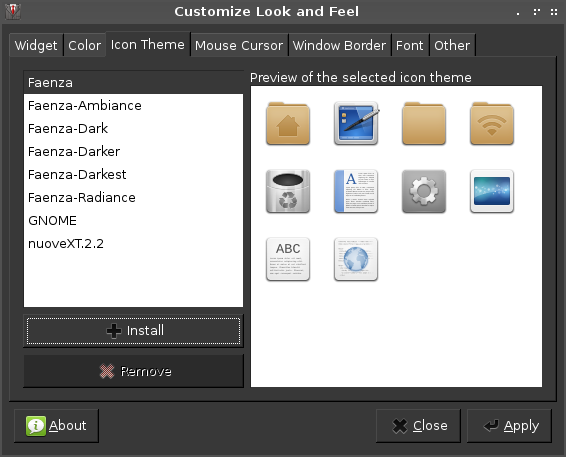 Download icons from gnome-look.org, kde-look.org, box-look.org and other. Then download tar.gz or tar.bz file. On icon tabs click install to install new icon set. Then choose the file, then ok, your icon will be installed. Another way, you can find icon theme from AUR repository. To apply just click "apply" then your icon theme will be changed.